Gunmetal ion-plated stainless steel case and bracelet. Uni-directional rotating gunmetal ion-plated bezel. Black and grey dial with luminous hands and Arabic numeral and stick hour markers. Tachymeter around the outer rim. Dial Type: Analog. Luminescent hands and markers. Date display at the 4 o'clock position. Chronograph - three sub-dials displaying: 60 second, 60 minute and 1/10th of a second. Quartz movement. Scratch resistant mineral crystal. Pull / push crown. Solid case back. Case diameter: 45 mm. Case thickness: 13 mm. Round case shape. Band width: 22 mm. Band length: 9 inches. Fold over clasp with safety release. Water resistant at 50 meters / 165 feet. Functions: chronograph, date, hour, minute, second. Sport watch style. 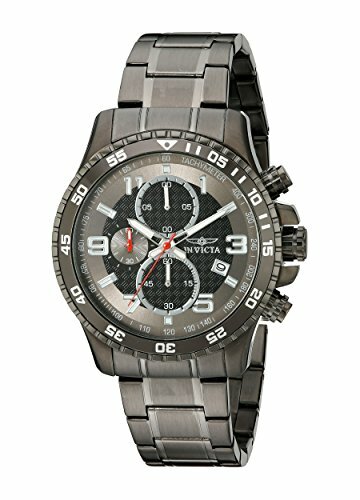 Invicta Specialty Chronograph Grey Dial Gunmetal Ion-plated Mens Watch 14879. Dressed in class and sophistication, the Invicta Men's 1203 II Collection Chronograph Stainless Steel Watch will be hard to take your eyes off of when you go to check the time. Its outward appearance begins with a 45mm brushed and polished stainless steel case and a stainless steel unidirectional bezel with a coin edge and a black-toned top that displays Arabic and index markers every five seconds. The grey dial, which is protected by a flame-fusion crystal, offers silver-toned luminous hour markers and hands, which are powered by legendary Swiss quartz movement. The dial also features three chronograph sub-dials and a date display between the 4 and 5 'o clock positions. A stainless steel three-link bracelet straps the watch to your wrist, while a fold-over clasp with a safety makes sure it stays there. Finally it offers water resistance up to 330 feet (100 meters). Stainless steel case with a stainless steel bracelet. Uni-directional rotating stainless steel bezel with a blue top ring. Blue dial with luminous silver-tone hands and dot hour markers. Minute markers around the outer rim. Dial Type: Analog. Luminescent hands and markers. Date display at the 3 o'clock position. Chronograph - three sub-dials displaying: 60 second, 60 minute and 1/10th of a second. Quartz movement. Scratch resistant mineral crystal. Pull / push crown. Solid case back. Case diameter: 50 mm. Case thickness: 15 mm. Round case shape. Band width: 28 mm. Band length: 8.25. Deployment clasp with push button release. Water resistant at 200 meters / 660 feet. Functions: chronograph, date, hour, minute, second. Casual watch style. 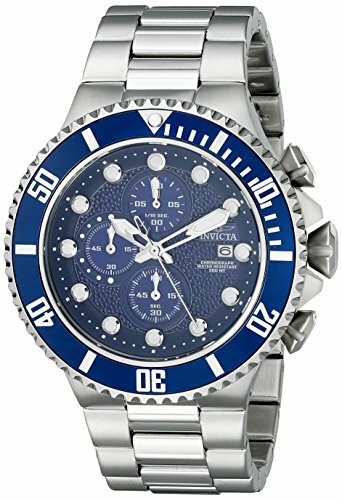 Invicta Pro Diver Chronograph Blue Dial Stainless Steel Mens Watch 18907. 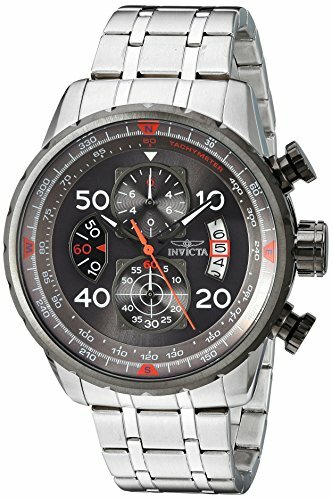 Invicta 22970 Aviator chronograph men's watch features a 48mm wide and 17mm thick two tone gunmetal ion plated solid stainless steel case with a fixed bezel and textured push-pull crown with function pushers. 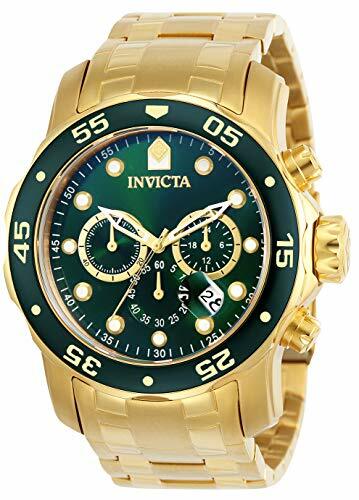 Invicta 22970 is powered by Japanese TMI VD57 quartz chronograph movement. 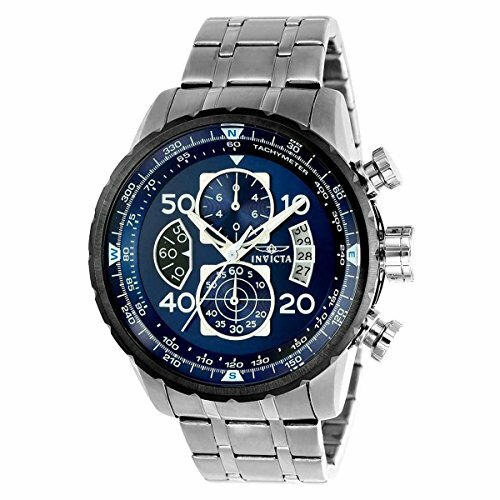 This stylish watch also features a textured shiny blue dial with white accents silver tone luminous skeleton hands and index hour markers along with the chronograph, compass and date display functions, scratch resistant flame fusion crystal and water resistant to 100 meters. 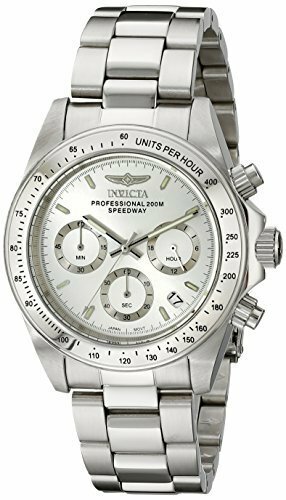 Invicta 22970 is equipped with a 24mm wide solid stainless steel bracelet with a fold over safety lock clasp. 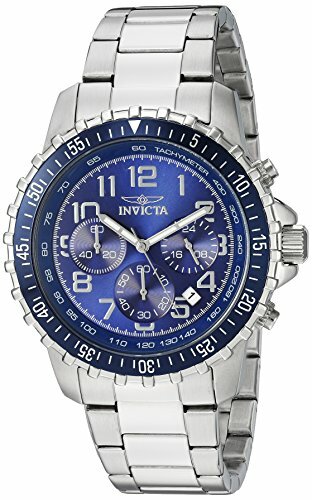 Invicta 22970 men's Aviator blue dial steel bracelet chronograph compass watch is brand new and comes in an original Invicta gift box and is backed by a 5 year limited warranty. 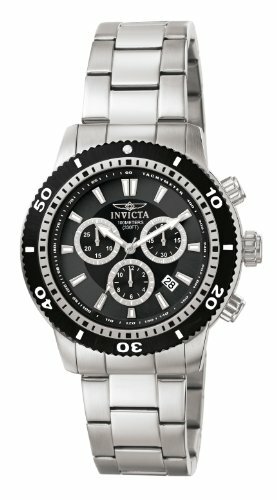 Looking for more Invicta Chronograph Bracelet similar ideas? Try to explore these searches: Gmc Yukon Fan, Silver Many Circles Bracelet, and Mounted Automatic Shifter. Look at latest related video about Invicta Chronograph Bracelet. Shopwizion.com is the smartest way for online shopping: compare prices of leading online shops for best deals around the web. 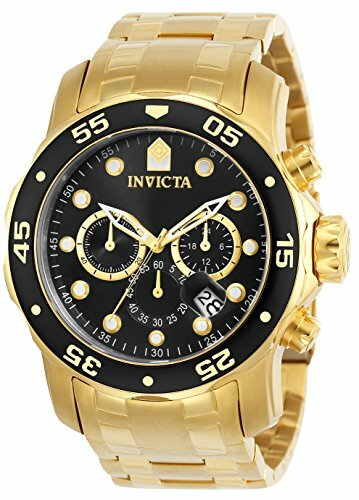 Don't miss TOP Invicta Chronograph Bracelet deals, updated daily.